Have you ever wondered what it takes to be a contestant on a game show? What would it be like once you were under those bright lights? Would seemingly simple questions become harder to figure out than a college-level calculus equation? And most importantly... are the host's teeth really that white in person? "Who Wants to be a Millionaire" on ABC is currently seeking Guinness World Record holders to be contestants on our show during an upcoming specialty week shooting October 12th. We came across your record for most times to spit and catch two ping pong balls with the mouth and would like to know if you still hold that record, or any others. If you do and would like to be on our show, please fill out the attached application and questionnaire and send it back to us. Do I want a shot at a million bucks? Nope. Too busy. PSSSHT...please! Of course I do!! This was doubly-cool, as filming was set to take place in mid-October, and I was looking to take my wife Marlo somewhere interesting to view the fall colors. Stamford - the city WWTBAM is filmed in - is only a couple hours away from the Hudson Valley, which, in case you didn't know, has an impressive list of hamlets (many founded in the 1600s) and state parks ideal for leaf-peeping. So, we packed our luggage, toothbrush, and Mimzy (our Yorkshire Terrier), and started our 7-hour car ride toward the coast. After two stops for tanks of gas and three more for food and potty breaks, we made it to Fishkill, NY, and promptly passed out. When we woke up the sun was shining, the air was warm, and we knew we couldn't have picked a better day for touring the valley. We hit the Vanderbilt Mansion, West Point, Nyack, and a little park called Quiet Cove Riverfront Park, and Poughkeepsie - all enhanced by the dazzling reds and golds of autumn. It was idyllic - just what was needed, considering the next day was guaranteed to be an exciting (but LONG) one in the studio. Time to Make Some Television! The alarm goes off at 7 A.M. and we jump out of bed, ready to roll. It's going to be exciting to see all the amazing contestants - Guinness Record holders, each one - and to find out if I can tackle 14 questions en route to a big payday. We arrive at the studio, which was a short, nondescript building in a tiny neighborhood just outside of downtown Stamford. We walk through the entrance, and are greeted by a group of 15 people all standing at the bottom of a stairwell. Cramped? Yes, but what better way to get to know your fellow contestants in as little time as possible? We met Susan Baroncini-Moe (longest continuous webcast), Kevin Shelly (most toilet seats broken with the head), Bob Bretall (biggest comic book collection), Fran Capo (fastest talking woman - 11wps!! ), and several others (and their plus-ones) - all amazing and wicked smart individuals. We all headed up to the greenroom after turning in our paperwork to the producers. Once we got upstairs, we finally had some space to spread out and relax. The various producers/lawyers all had ground rules and tips about how best to play the game...things like taking your time, breaking it down, see if the answer is in the question (it often is), don't hit your chest at all (that's where the mic is! ), etc. It was a lot to take in, but they were all rooting for each contestant, making sure we had a great experience. They also told us that they interviewed and quizzed at least 100 other potential contestants, and that the 10 in the room were distilled from that initial pool. Only then did it sink in just how lucky (and yes, skilled) we'd been! Now, if you've ever been on a show that involves more than a few people, you'll know that it can be a lot of work to put everything together. In this case, it involved waiting in the green room, doing a practice-run on the set to get comfortable, walking the audience into the studio once we were done, waiting in the greenroom, hair/makeup one at a time (each right before going on set), more waiting in the greenroom...you get the idea. Those of us waiting for our turn eventually started watching past episodes of WWTBAM to stay sharp and hone our strategies - all the while wondering how our new friends were faring as they each made their own climbs toward what we hoped would be "big money"! As the day went on, it was obvious that they weren't going to get to all of the contestants - only four of us had been called by 5 P.M. Marlo and I were wondering if they were even going to use us at all. Everyone was guaranteed $1,000 for even showing up at the studio, but I'm a bit of a trivia nut, and I wanted to test my skill on the big stage - to prove to myself that I could handle that level of pressure. Just when we were giving up hope, they called our names! We jumped up and went off to get beautified by the wizards in the hair/makeup room, then made our way to the set. They were still filming Susan's portion of the show, so we waited backstage, all the while trying to keep the butterflies from flying out of control. Once Terry Crews shouted out my intro, the adrenaline kicked in big-time. Not only was I lucky enough to make national TV, I was going to meet one of my favorite comedic actors. You probably already know this, but Terry Crews is big - bordering on COLOSSAL. Giving him a bro-hug, I was completely swallowed up. He was a super nice guy...excellent at putting his guests at ease, and a pleasure to talk to - the ideal host. The first question up on the board was one involving months with national holidays. Now, being a professional entertainer, it wasn't particularly important that I be familiar with such things, and I gotta tell you, I was a deer in the headlights. I started going through the months one-by-one, but I couldn't remember which holidays were religious/federal/other. It was time to ask the audience. Thankfully, they were much more knowledgeable than I was in this instance, and they bailed me out nicely. Thanks, y'all!! There was one about Law & Order, one about a group seeking to repeal the 21st Amendment, and one involving a saying that everyone is familiar with - all of which I thankfully didn't need my lifelines for. When Terry asked me the question pictured on the left, I thought I knew the answer, but it was the perfect opportunity to use my plus one...just to be sure. My wife, Marlo, was the ideal person to ask, as she has a special degree in fashion as well as being from the Bay Area (home of The Gap). She confirmed my suspicion, and it netted us $15,000 more in the bank. Way to go, honey! So it was smooth sailing until we got to a movie question. Now, I have spent an inordinate amount of time over the years on the Internet Movie Database (IMDB) - also the unmatched resource when playing the Six Degrees of Kevin Bacon. 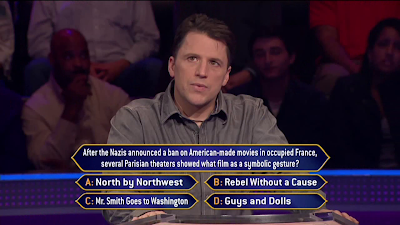 I should have been able to answer this question, but couldn't figure out what the question was really asking...which was "which of the following movies had been released by 1940?" Well, I jumped the question, rather than risk my $60,000 bank, and hoped that an easier question would follow. The last question standing in my way was one of etymology. While I am familiar with a lot of the Latin roots of many words, the Greek ones were more obscure. With Classic Millionaire so close, it was tempting to just go for it...but I promised myself I would NOT scrub out. Besides, $32,800 is not an insignificant amount of money - so I decided it was time to pack up camp and call it a day. It turned out that it was the right decision, as I was about to guess the wrong answer! So, what did I get out of the whole experience? 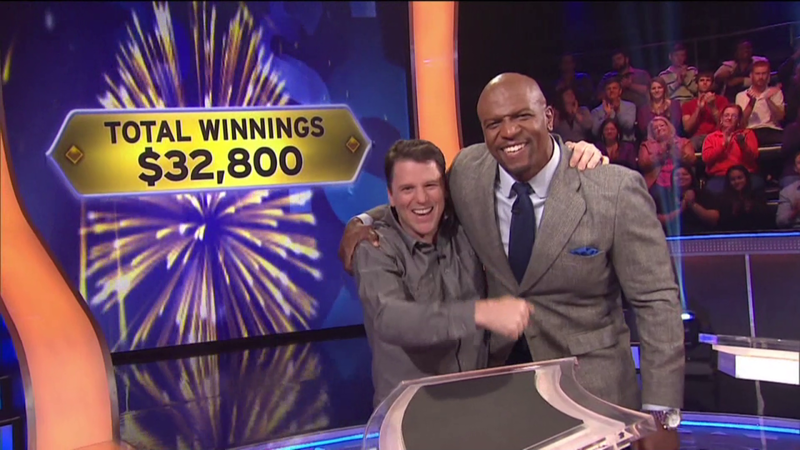 Sure, there's the money, but equally treasured were the new connections Marlo and I made with the other contestants. Additionally, we had a SuperHappyFun time at the viewing party with all of our friends and family. After all, shared adventures are way more gratifying than the ones merely experienced first-person! 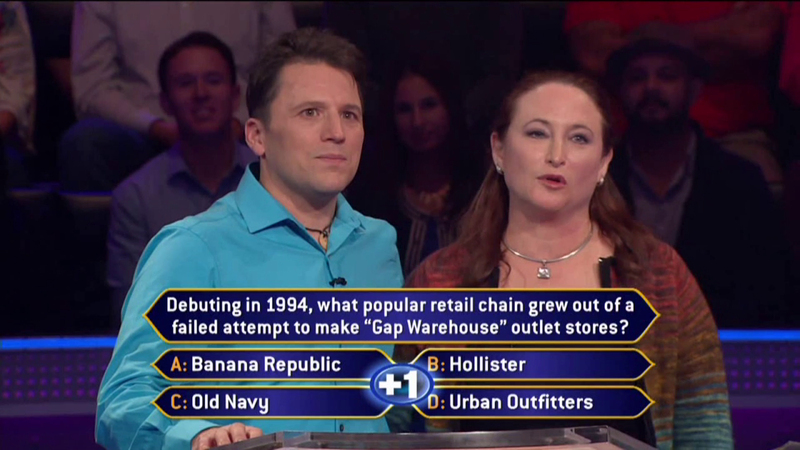 If you'd like to get another perspective on the game-show experience, I'd highly recommend reading the other contestant's blogs covering their time on Who Wants To Be a Millionaire. I found them fascinating, and not just because I had the chance to meet the people writing them. Susan's can be found here, Bob's here.